Sully is the movie America needs right now. Time is on Sully’s side. But it wasn’t on Captain Chesley “Sully” Sullenberger’s (Tom Hanks) side on January 15, 2009, when a flock of Canadian geese took out both engines on the Airbus A320 he was piloting out of LaGuardia. Three minutes into US Airways Flight 1549, Sully and co-pilot Jeffrey Skiles (Aaron Eckhart) had to make life-or-death decisions under extreme duress as their plane lost power. Sully, directed by Clint Eastwood, should not be seen by anyone who is already afraid to fly. It’s an understatement to say that its multiple sequences depicting what happened on that doomed flight were harrowing. They were downright terrifying. I was straight-up bawling each time Eastwood revisited the 208 seconds in which Sully decided his best bet was to guide the plane down to the water below. Bawling. I could not contain myself. Which is especially crazy because we all know this story has a happy ending! Maybe it’s because I spent three years of my life flying in and out of LaGuardia every few weeks for work. Maybe it’s because I could understand what the mother holding her baby must have felt like when she heard “Brace for impact” come over the speaker. Or the family members who were separated by several rows. Or the person traveling with an elderly wheelchair-bound relative. Maybe it’s because I remember being glued to the screen that fateful day, amazed to see 155 people emerge from a plane ON the Hudson River. Or maybe it’s because the world—and the United States in particular—seems like an especially scary place right now, so the sight of dozens of people who didn’t know each other but were willing to help each other in an emergency is what I was really shedding tears over. Sully shows this country at its best, and we’re in dire need of such a reminder. So I would recommend this film for those sequences alone. In the moments I wasn’t losing it, I was fascinated to learn exactly what happened in the plane, the cockpit, the radio control tower (which was also surprisingly moving), and elsewhere along the river as the flight began its descent. Do I even need to say that Tom Hanks was the perfect man to play Sully? Duh. No, I don’t. I just wish that Eastwood—who is clearly a fan of the heroic pilot—had spent a little more time filling in Sully’s background for us. We only got a few brief flashbacks. The movie is set immediately after the “crash” (“WATER LANDING, FOR THE LOVE OF PETE!!! !” – Captain Sully), and Sully and Skiles are pulled into a National Transportation Safety Board investigation before they can even go home. So we get a bunch of scenes where Sully is calling his wife Lorraine (Laura Linney) to tell her what’s going on, and unfortunately they are boorrrring. Linney was totally wasted in her role, and the Sullenbergers’ exchanges served no purpose in the film. We already know that Sully is shaken by what happened, is questioning whether or not he did the right thing, and is stressed out that the NTSB agents are trolling him. It was also kind of cheesy that Katie Couric played herself interviewing Sully, which of course really happened… seven years ago. The biggest issue with Sully is that aside from the flight, the rescue and the investigation afterward, there’s just not a lot of meat Eastwood had to work with. 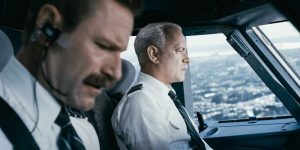 Todd Komarnicki adapted the screenplay from Sullenberger’s memoir, yet we still didn’t get much insight into the title character. I found myself wishing that some of the passengers on the plane had been more fleshed out. The film is Eastwood’s shortest, but it still felt like he was straining to fill the time. Now that we know what Sully did in just 208 seconds, it seems like a shame that Eastwood couldn’t make all 96 minutes of the captain’s biopic more compelling. The Bottom-Line? Sully is worth seeing on the big screen for its amazing recreation of Flight 1549. It’s also worth seeing if you need to restore your faith in humanity.